This means that another Hi-Rez game (such as SMITE or Tribes: Ascend) is currently installing or updating. You can check this by clicking the gear shift in the bottom left and clicking the “Troubleshoot” button. All games are listed in the Installed Games section towards the bottom. This message means that one of your games is not on the correct version. Close your launcher and relaunch as administrator. If an update does not occur after doing this and logging back in, click the gear shift in the bottom left of the launcher > click the “Troubleshoot” button > click the “Check for Updates” button. This message can appear in several forms, but there are a few key things to do for any Update Service error. First, make sure you are running the launcher as administrator by right clicking your shortcut and selecting “Run as Administrator.” If that does not resolve your issue, check to make sure the update service is actually started. 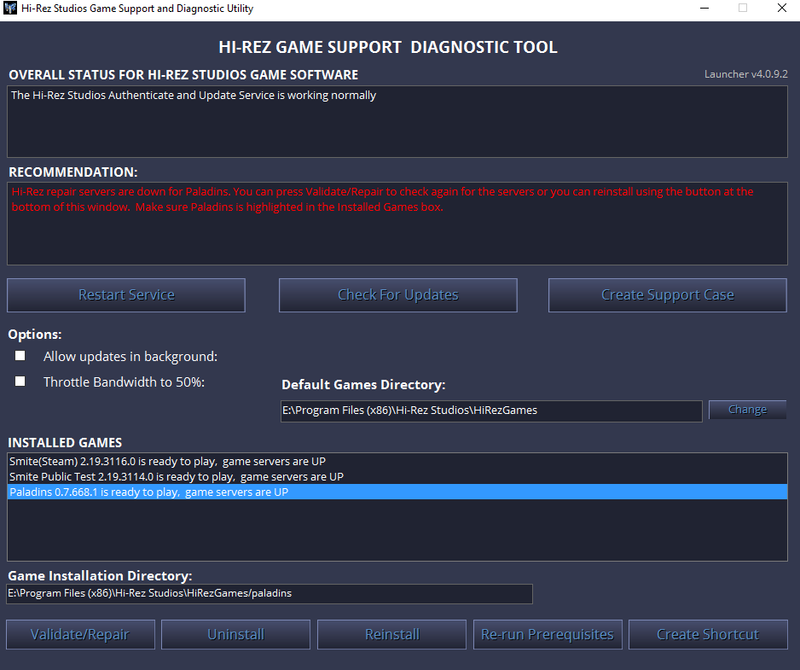 To check if the Update Service is running, do a Windows search for ‘services’ and then look for the service called “Hi-Rez Studios Authenticate and Update Service.” If the status of this service is not “Started” right click the service and select “Start.” If for any reason you are unable to start the service, reboot your PC and try again. It is also possible to simply not have the service installed. If that is the case, you will need to run InstallHirezService.exe from your redist folder of your installation directory. When this occurs, it is best to follow the steps in the section above regarding the update service. This issue can most often be resolved by re-running prerequisites. To do this, click the gear shift in the bottom left of the launcher then press the “Troubleshoot” button. Next, click the “Re-run Prerequisites” button at the bottom. If that does not fix the issue, repeat the process but press the “Validate/Repair” button instead. In the event that the above steps do not work or you are experiencing an unrelated problem, the best thing to do would be to download and run the following repair tool. After downloading the tool, it is best to right-click on the executable and choose RUN AS ADMINISTRATOR. Last edited by EvilMojoAlyssa; 06-08-2018 at 09:45 PM. I am getting a "402 CreateFile Failed" window whenever I try to install the game. I purchased a beta key to Paladins. Ive just redeem this in launcher and its worked. When I run a game, in login menu under Login and Password I have red-text: "the login information submitted is invalid". Its first time I logging in, well I dont know why I have this problem. Its not a problem, because I can log in. When Im writing my login and password, next I have a Regulations and I accepted that. Next I must write my Nickname. When I picked anythink: For example: KochamMaslo, Its loading and then I have the same error: "the login information submitted is invalid" under my nickname. I cant play, because I cant pick my Nickname. I tried different nickname. Its not working. Please help me, because I want to play this brilliant game! So, I went to update paladins today in light of the recent patch, and it wouldn't work. It wouldn't update at all, and say the game was ready to play, but when I went to log into the game, there was a version mismatch. I tried restarting the client and the computer, logging out of hirez services, clicking "checking for update" in the troubleshoot window, and the last thing I tried was uninstalling paladins, and then all hirez apps on my computer, and now I can't install smite, most of the files need to play paladins or smite are gone, and smite won't install. Please help me. That is because the Hirez patch server is down and they have not commented on anything yet... Such fail they are. I have a beta key, or purchased the Founder's Pack. How do I install Paladins? Step 1: Download the Paladins installer from http://www.paladins.com/#installation (NOTE: Download will be available starting November 17, 2015). Step 2: Use your existing Hi-Rez Account to login to the launcher. You likely have a Hi-Rez Account if you played SMITE, Global Agenda or Tribes: Ascend. If you do not have a Hi-Rez account, you can easily create one in the launcher. Step 3: In the launcher, after the game downloads, you will be prompted to enter your Beta Key. If you purchased the Founders Pack on our website, the account you purchased the Founder's Pack with is already authorized. Step 4: Enjoy the game!!! If you have an issue with the installation, please keep reading!